Given how popular George Lucas’ Star Wars series is, it makes sense that there is more than one Star Wars user mod for Skyrim. 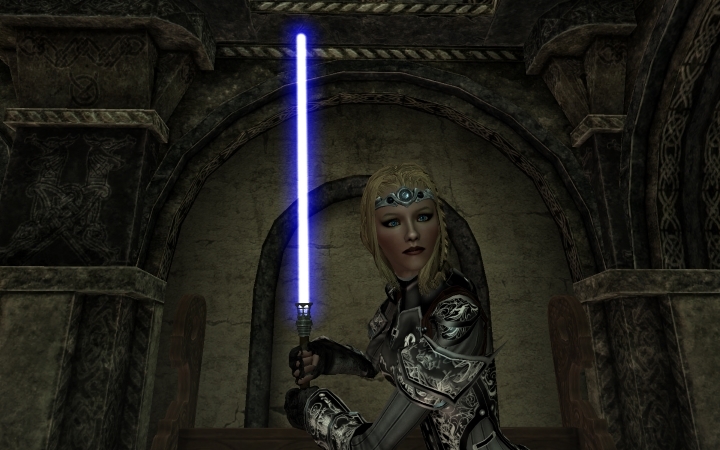 This one in particular gives the Dragonborn the kind of weapon you definitely don’t expect to encounter in a medieval fantasy game like Skyrim… And you can probably guess that weapon is Star Wars’ famous lightsaber, which lets you play Jedi in Skyrim’s world. And not only has the author of this mod made sure that the lightsaber in the game looks and sounds like in the Star Wars movies, you also get a variety of colours to choose from… So you can wield a lightsaber with a red beam and pretend you are playing an evil Sith Lord, and even dual-wield lightsabers as you could in a game like Bioware’s Star Wars role-playing game Knights of the Old Republic.